A silver Roman Republic denarius issued by C Antius C.f. Restio, and dating to 47 BC (Reece Period 1). Obverse shows the jugate heads of the Dei Penates and the reverse inscription reads C.ANTIVS C . F; Hercules walking right holding club and trophy, cloak over left arm. Mint of Rome. RRC 455/2a; Syd. 971. The coin has been countermarked, once on the reverse with a 'C' like symbol, while the obverse has two countermarks; at 3 o'clock a 'D' shaped mark on its side, and in the centre an inverted 'V'. If the coin is rotated to 6 o'clock, the countermarks appear as 'AV'. 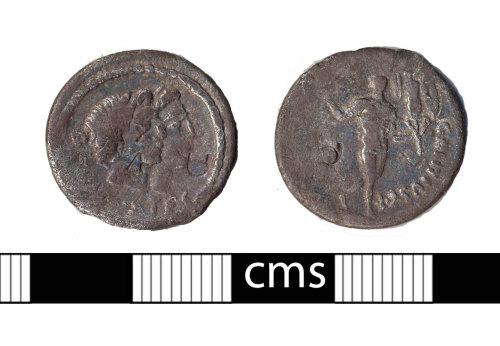 Reverse description: Hercules walking right with cloak over left arm, holding trophy in left hand and club in right hand. Border of dots. Republican moneyer: Antius Restio, C.